An eight-room suite hotel located in downtown Fort Davis. Each room offers a refrigerator, microwave, tv with dvd player, coffeepot, quality linens, pillow-top mattresses, internet access and more. Built in 2005, it is the newest hotel in town and also offers retail and office space on its lower level. Additional suite accommodations at the Harvard Lodge on the H.E. Sproul Ranch. One handicap accessible room is available. 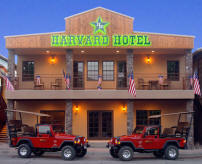 Davis Mountain Jeep Tours can also be booked through the Hotel.